For those living on Grandville Avenue, the name Synia Jordan represents a legacy of refusal to subjugate. Synia Jordan is the granddaughter of Synia McBride, a once long-time resident on Grandville Avenue, who during her lifetime refused to sell the property on 569 Division Avenue SE, a building she purchased in 1943. Eventually, Jordan explains, her grandmother lost the legal battle to the City of Grand Rapids and was forced to sell the Synia McBride inside her restaurant, Chicken Shack. property on the grounds of eminent domain. Eminent domain refers to the power to take private property by the state, city, or municipality with the idea that it would be for public use. Owners are paid the fair market value of the property. When McBride owned 569 Division Avenue, her building stood on the corner of Pleasant Street and Division Avenue. The buildings and businesses from Ionia Street to Division Avenue Street were demolished and consequently displaced in 1984. The property was later sold to Van Eerden Foodservice Company, which now stands on 560 Ionia SW. The week she was supposed to move out of the building, McBride died in her sleep. “She died of a broken heart,” shares Jordan. 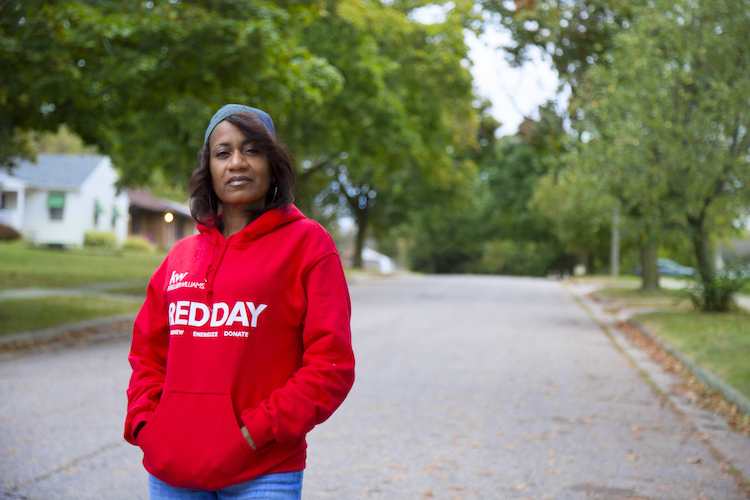 To Jordan, the memory of her grandmother still brings her a lot of pain as it is a continuous reminder of the ways the black community in Grand Rapids has been and continues to be excluded from economic opportunities. According to the U.S. Census, 40 percent of Black residents in Grand Rapids are living in poverty. In other words, four out of 10 Black families do not have the access to economic capital to purchase property in a city where the vacancy rate is below 1 percent and even finding an affordable place to rent becomes a very difficult for many black families who are living paycheck to paycheck. 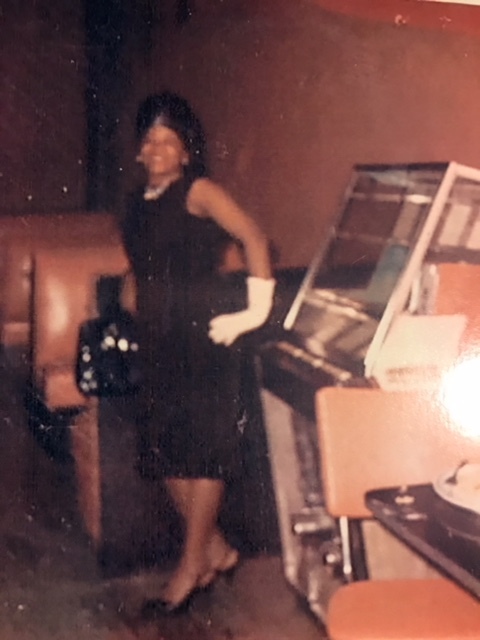 When Jordan was growing up on Grandville Avenue in the late 60’s, she remembers the neighborhood as a predominantly Black American neighborhood. According to U.S. Census data, among those living on Grandville Avenue between the railroad tracks on Century Avenue and the intersection of Clyde Park further south, 13.7 percent are Black residents, 72.4 percent are Latinx, and 11.3 percent are white. Even though McBride is no longer with us, and the building she originally owned has been demolished, her spirit continues to live on the avenue today through Jordan’s advocacy. Jordan, like her grandmother, refuses to leave Grandville Avenue. Even though she is regularly approached by buyers about selling her properties, including the building that houses her business, Samaria J’s, she has no plans of selling. Samaria J’s, a hair salon specializing in healthy hair treatment, stands on the corner of Rumsey Street and Grandville Avenue SW and the home on 521 Church Place SW, near Pleasant and Grandville Avenue. Today, 51 percent of homes are owner-occupied and 49 percent are renter-occupied. The area has a 15 percent vacancy rate when comparing it to the city’s vacancy rate of 9 percent, the Grandville Avenue has 6 percentage points increase. In other words, the area offers more housing opportunities than any other area in the city making it an accessible option for those living on limited financial means. As Jordan prepares to face the changes that are coming pending the approval of the Area Specific Plan, she is fighting to ensure all the development coming in will be in line with the neighborhood plan. The Area Specific Plan was a resident-led plan to guide future improvement and development with a specific focus on housing, transportations, aesthetics, and land use. In partnership with Roosevelt Park Neighborhood Association, Habitat for Humanity of Kent County, City of Grand Rapids, Williams & Works, and Nederveld neighborhood feedback was collected in over 20 meetings across the corridor throughout the course of a year. The plan can be read in both Spanish and English, here. The plan is an amendment to the City of Grand Rapids Master Plan adopted in 2002. According to the data collected, 52 percent of respondents selected “their house or their apartment” as the number one reason they live in the neighborhood, “neighbors” was had a close tie with “amenities” at 42 and 43 percent. The plan advocates removing Grandville Avenue as a part of the M-DOT business route designation. Currently, the truck route begins at Clyde Park to Franklin Street on Grandville Avenue. Jordan is in agreeance with Brouwer, who believes residents have been heard and their needs included, and will be continuing to advocate to ensure the plan includes low-density housing. According to the feedback from residents outlined on the plan, the greatest threat identified is displacement occurring as development comes in. The longtime resident believes that investment doesn’t need to displace people when coupled with relationship-building. “Developers need to ask of the businesses and residents what makes them feel like they belong here--and this will help them begin to understand the pride and ownership this community has for itself,” shares Jordan. Jordan explains she has been working with residents who are facing citations from the city for not keeping up their yard or the outside of their house per City standards. A resident could face a citation for things like tall grass, storing a disabled or inoperable vehicle within the confines of the property, or if they are contributing to the “deterioration of the property,” per the standards detailed on the website of the City of Grand Rapids. Jordan worries that the residents who receive these violations might end up leaving the area if they aren’t able to keep up their property to the standards the City requires. “Many people in the community own their own homes, but then they receive these tickets or notices from the city telling them that they need to keep their house a certain way,” shares Jordan. Jordan explains that many Spanish-speaking residents don’t understand the notices because they are only sent out in English, and many others simply don’t have the resources to address the issues. “I know my voice is just as strong as yours. I have a voice and I will use it,” shares Jordan. Jordan sees her role in the community to be a strong voice and an advocate for others to use their voice. Her refusal to relinquish and give up the space she occupies as both an investor of the community and a community member make Jordan a force hard to reckon with, especially when it comes to warranting the voices of communities of color on the avenue guide every process.